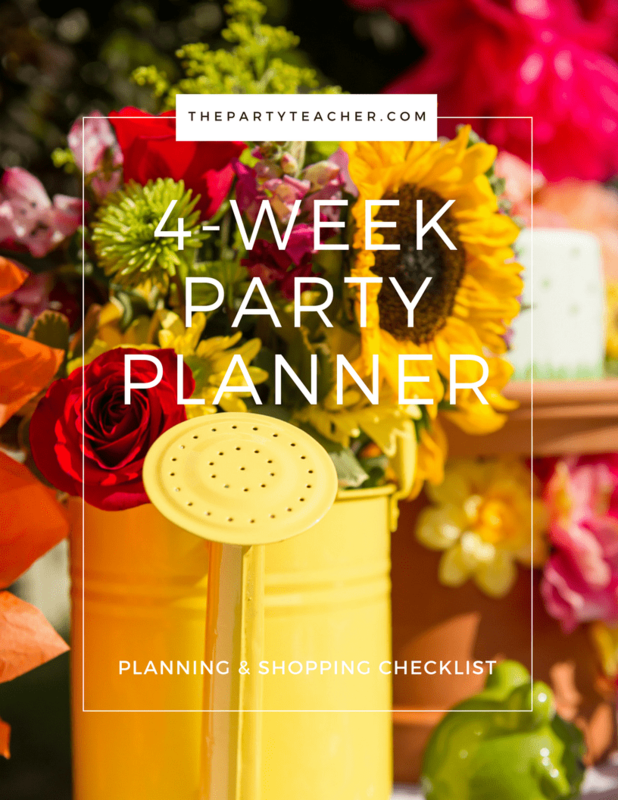 We’re following the steps outlined in my free 4-Week Party Planner, but I’m consolidating the steps in our series. For all the details, sign up to get a copy of the party planner to use for planning any party. When your party planning window is running short, you need to do a little bit each day to be ready on time. I've broken down all the key steps into daily tasks. Tackle one item a day for four weeks, and you'll be ready by party day. Today, we’re talking about your 4th of July party centerpieces. Creating party centerpieces is always one of my favorite parts of party planning. And don’t worry: you don’t have to have great flower arranging skills or any other special skills to create a centerpiece that ties your table all together. Here are some of my favorite tips. Skip the florist and turn to your grocery store if you need help. Then, bring your own vase(s). You also may want to bring an inspiration photo to help you communicate clearly what you want. Don’t get your heart set on a flower that’s not in season — that’s just asking to spend more than you need to. Skip or minimize roses. Pick almost any other flower and you’ll spend less. Go for flowers with sizeable blooms for extra impact without buying extra flowers. Spider mums are your friend. Or, choose flowering plants instead of creating a cut flower arrangement. Pick one flower in one color. Or, pick multiple types of flowers in one color. Either way, you get impact through a monochromatic approach. Any flower will do, but skip the garish dye. Natural blue hydrangeas would be pretty, but otherwise, I’d stick with white or red. Keep your arrangement small and tight instead of making one large centerpiece. You want guests to be able to see each other across the table. If your arrangement is small enough, you can repeat it a few times down the length of your table. Think outside the vase: tea cups, tin cans, mason jars, trophies, julep cups, wood boxes. If flower arranging is not your thing, use bud vases and add one showy flower to each. Centerpieces don’t have to be flowers. The centerpieces below include paper-covered foam balls, lollipops and cherries. Easiest idea of all: whatever you create, add mini flags to your arrangement. If your party will be inside (out of the heat) create a 3-D table runner out of red, white and blue balloons. You also can skip a vertical centerpiece if you create a table runner from paper pinwheels. You can find them at dollar stores and use dimensional glue dots to overlap the fans together. I normally advise against lit candles at children’s parties, but if you are eating outside, candles in a hurricane globe will add atmosphere. One “please don’t do this” note: Please don’t use our flag as a tablecloth or table runner. You’ll see this on Pinterest using our actual flag — not just flag-print fabric — and it’s not respectful. Here’s a summary of the U.S. Flag Code. For even more ideas, check out my 4th of July party Pinterest board. 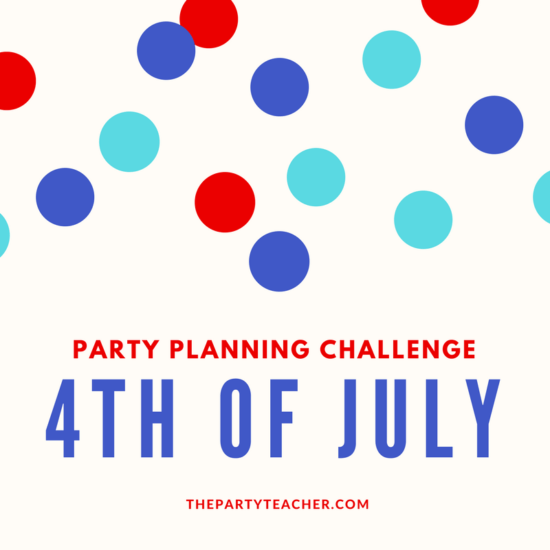 There’s more of our series to come — my schedule for the final push in your party prep PLUS free 4th of July printables! In the meantime, be sure to grab your free 4-week party planning guide.